Custom stamp tools are made using artwork you supply. We accept black & white artwork on paper or any of the following file types: .PDF, .JPG, .TIF, .CDR, .AI. If you have questions about what kind of artwork to provide, you can ask before you pre-pay by contacting us at tools@4clay.com. You can order a custom stamp online from the different types of stamps listed below. Then send your artwork to us by email for creations of the stamp. We will contact you with any questions once we receive the order and artwork. It takes about 1 week on average to get a custom stamp made. Custom stamp pens in 3 finish colors. 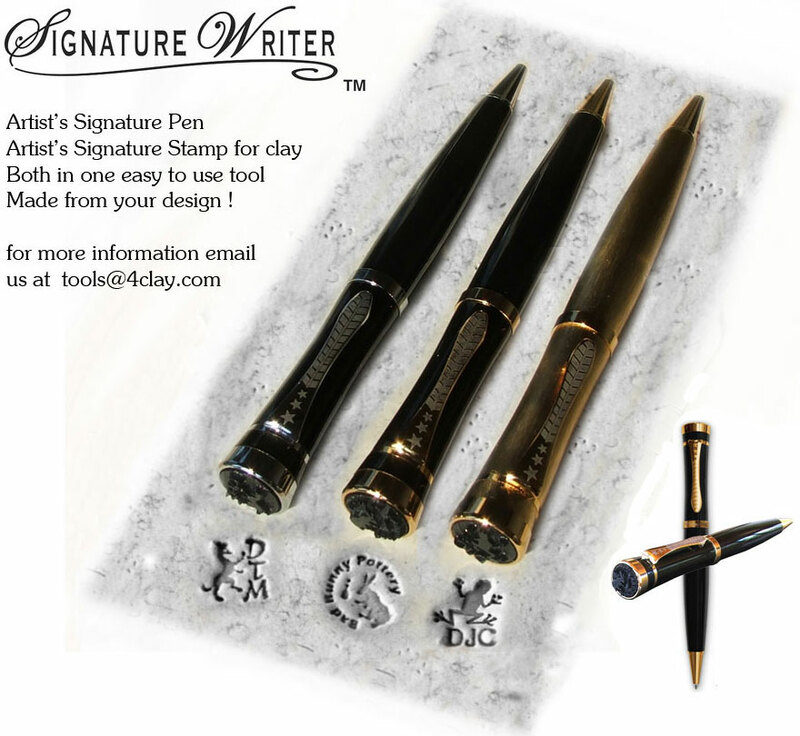 Signature Writer (TM) stamp pens are exclusive designs from www.4clay.com for use by clay artists around the world. All designs are copyright (C) 2017 SOCWELL LLC. Our Signature Writer stamp material allows for durable fine detail clay stamp in the top with our fine writing instrument assembled here in our shop. The Signature Writer Pen makes a nice gift that can both write as a normal ball point pen or stamp clay with a maker's mark. All pens come with standard blue ink and include 2 piece gift box. If you would like to see if your maker's mark might work for this unique stamp pen please email us at tools@4clay.com and we can setup a free proof. How will you send artwork? Send e-mail with artwork file & instructions to tools@4clay.com Send paper art to Socwell LLC, PO Box 719, Whitewater, WI 53190 Other method, please contact me by e-mail.